What a FABULOUS gift! 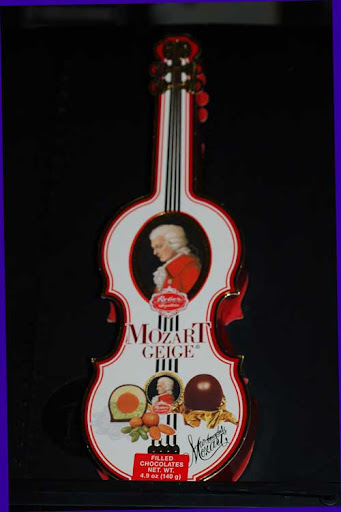 Are they those little Viennese "Mozartkugeln," with the pistachio marzipan and nut inside? Yum! I've gotten these before, and I keep all the boxes and use them as Christmas decorations. Today, one of my adult students gave me three, count 'em, THREE bags of Ghirardelli Squares! Woo Hoo! Terez, I think you've described the chocolates I got. They are sublime. Each one is a work of art. Laurie, I love your suggestion for a gift for a violin teacher. Spread the word. Bram, I'm not surprised that Austria has more than one kind of Mozart chocolates, or chocolates in two different kinds of boxes. It's part of their culture. Anne, I like the box so much that I gave it a prominent, year-round place on my bookcase. Three bags of Ghirardelli squares is positively sinful. You must have a very good student. Anne-Marie, you're right. Violin teachers love exotic chocolates. Great idea! My teacher doesn't read this site so she'll never know I stole the idea. The next question is where to find them in Berkeley, CA.